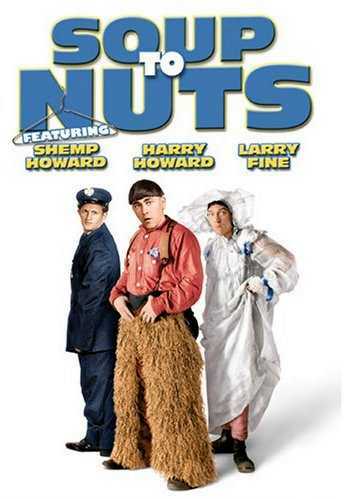 Soup to Nuts, the first movie with The Three Stooges, is not a typical Three Stooges movie. In it, the Three Stooges are mostly supporting characters, in a movie that stars Ted Healy – at this time, the act was known as Ted Healy and his Stooges. The Three Stooges include Shemp Howard (this movie was filmed before Shemp left the group and was replaced by his younger brother Curly Howard), Moe Howard (as “Harry” Howard) and Larry Fine. Fred Sanborn acts as a non-speaking “fourth stooge” as well. If you want a complete collection of the Three Stooges movies, then you will want to add this to your collection. Among other items of note, the move was written by Rube Goldberg, the cartoonist who made famous oddball contraptions to do simple things (think of the childrenâs game Mouse Trap for an example). Mr. Schmidtâs costume store is bankrupt because he spends his time on Rube Goldberg-style inventions; the creditors send a young manager who falls for Schmidtâs niece Louise, but sheâll have none of him. Schmidtâs friends Ted, Queenie, and some goofy firemen try to help out; things come to a slapstick head when Louise needs rescuing from a fire. Cameo appearance: Rube Goldberg a non-paying customer in Kleinâs restaurant. The first film appearance of The Three Stooges. First film appearance of Shemp Howard with the Three Stooges, and his last appearance with the group until he rejoined in 1947.